When should a child be introduced to the joys of reading? Four out of five doctors recommend waiting until the newborn is at least a day old. The fifth doesn’t believe you need to wait that long. Emil had the pleasure of writing two board books for Annick Press, both illustrated by the gifted, versatile Cindy Revell. A Button Story and A Pebble Story were honoured as Best Books for Children & Teens 2015 by the Canadian Children’s Book Centre. “A delightfully colorful book for younger readers. The text is simple, and the pictures bright and fun to look at. “Board books are a child’s introduction to the world of words, a crucial tool for ensuring a child will enjoy reading as he or she grows. Board books should be simple and appealing as well as educative. Parents and caregivers should consider themselves lucky that prolific Toronto author Emil Sher (Hana’s Suitcase, and many, many more books, essays, screenplays for children and adults) has turned his attention to writing for the pre-school set. Twinned with illustrations by Cindy Revell (A Sackful of Feathers, Room Enough for Daisy and more), they have produced a set of board books that will help establish the love of reading in a child. Each book in the set appears to be gender targeted, but the stereotypes are challenged because an adult of the opposite gender accompanies each child on her/his journey of discovery. A Button Story shows a little girl whose sweater is adorned with specialty buttons in the shape of a sun, a star and a boot. But the last button is missing, and so she and her father go on an adventure to the button store where they are surrounded by amazing buttons. They buy another special button and sew it on. When the lost button is found, they attach it beside the new button, and the sweater becomes even prettier than before. A Button Story is a pleasant story to which young children will relate. Parents and caregivers can pull out sweaters and either talk about the buttons, count the buttons or find new buttons to decorate the sweater. 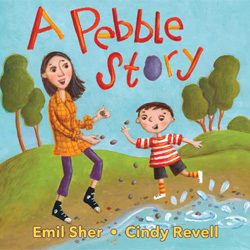 A Pebble Story follows a little boy and his mother as they look for the right pebbles to form the funny smile in the child’s art project. The boy sees many imagined pebble shapes in his search. This story can prompt children and their caregivers to create untold numbers of pebble-art projects together and, at the same time, it gives the adult the opportunity to teach a child about the composition of rocks, erosion, insects, earth, etc. Cindy Revell’s artwork shows happy children and their involved parents, bonding in their experience. Her figures are only slightly cartoonish, with round faces and big, round eyes, adding a positive tone to the pictures. But the children have typical expressions and wear contemporary clothing that will make a young child identify with the characters. The pebbles are realistic-looking as are the buttons in A Button Story. Revell’s soft brush strokes and gentle colours will appeal to small children. These books would be a positive purchase for a home or day-care setting, for a read-aloud with an adult or for a child to read and enjoy on his or her own.